Welcome to this week’s edition of Jaime’s Lazy Late Night Cooking Corner, the show where I whip up last-minute single serve microwave treats every Thursday while wearing my robe. Today we are making an all-american treat in an all-american appliance, our microwave. We made two microwave apple pies, one with cheddar cheese, and one without. Cameraman Matt and I both vote 100% in favor of salty cheese on our sweet pie, but Prudent Editor Colleen almost threw up in her mouth at the very idea of cheese on pie. What are your thoughts on cheese + pie? My thoughts align nicely with this quote from Cameraman Matt: “Apple pie without the cheese is like a hug without the squeeze!” Yes! In previous episodes we’ve made 4 Minute Microwave Potato Chips, 4 Minute Microwave Carrot Cake, Bye Bye Bunny Microwave Peep S’mores, Single Serve Microwave Rice Krispy Treats, Microwave Blueberry Cobbler in a Cup, Microwave Strawberry Shortcake for Two, a Microwave Lemon Bar, Two-Minute Microwave Cheesecake in a Cup, 3-minute Microwave Guinness Chocolate Cake, and even a Microwave Cinnamon Roll. 1 green apple, cored, peeled, and cut into small chunks. Place cookies in a plastic bag and smash into crumbs. If using one mug, jar or bowl you can do this recipe without splitting your crust, so feel free to place all ingredients in one jar, but I made two so I could do one with cheese and one without. So if doing two like me, split your tablespoon of butter in half and place in your two ramekins and melt in the microwave (approx 15 seconds). Add cookie crumbs and mash with fingers to coat the crumbs. Press up onto sides of your ramekin or mug. 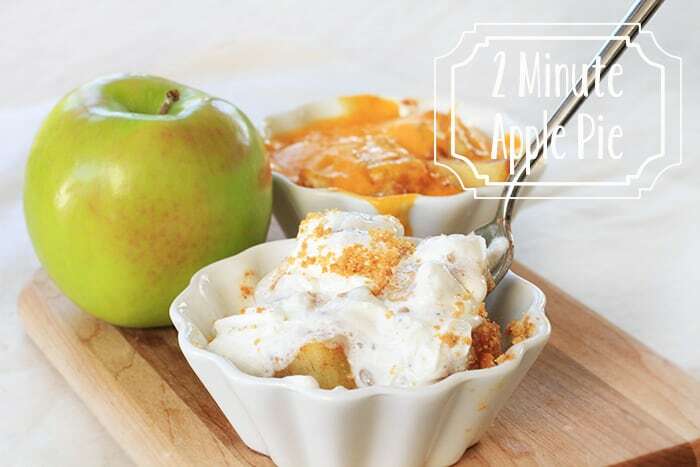 Place your apple chunks into a measuring cup. Add flour, powdered sugar, and apple pie spice, then stir to coat. Squeeze wedge of lemon on top and mix again. Put measuring cup in the microwave to soften for 2 minutes. If you like cheese on your pie (you should! ), add a slice of cheddar and microwave for another 20 seconds. If not, you’re crazy, and you can just top your pie with more cookie crumbs for a little crunch and some whipped cream. 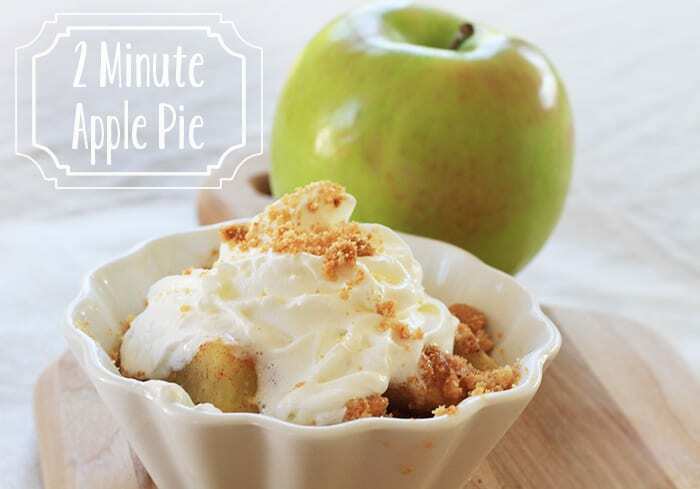 So tell us in the comments: When it comes to apple pie, TO CHEESE OR NOT TO CHEESE? I love your cameraman’s quote! That’s awesome!!! Apple pie with cheese! I’ve never heard of such a thing! I can definitely see the potential deliciousness there…will have to give it a try! That looks amazing. I am going to try it tonight. I think this sounds great! I tried to pin it, but I couldn’t because the image could not be fetched. Any ideas? i think it’s a pinterest bug this morning. tried to fix it, but i’m not sure what’s going on. Thanks I was able to pin it from your Pinterest board. I really enjoy these small serving recipes, I make them for hubs and me, we are a household of two now. I also send the info to my college-aged DGS to fix in the dorm, he has only a microwave to cook with. You do a very nice job, thank you. Oh YES, Cheese. But it has to be cold, sharp cheddar, on room temperature pie! My husband’s grandpa says, “Apple pie without cheese is like a hug without a squeeze!” While I disagree (sharp cheese on something sweet, with cinnamon? ), I think the saying is cute. Can I simply say what a relief to find somebody that genuinely knows what they’re talking about online. You actually know how to bring a problem to light and make it important. More and more people need to check this out and understand this side of the story. I can’t believe you aren’t more popular since you definitely possess the gift. I such a lot indubitably will make sure to don?t omit this website and give it a look on a continuing basis. Its not my first time to visit this site, i am visiting this site dailly and obtain pleasant information from here daily. I was suggested this blog by means of my cousin. I’m not sure whether or not this post is written by means of him as nobody else recognise such certain about my trouble. You are amazing! Thank you! Oh yes, cheese please. Even my picky eaters had a blast with this one. Since finding this site,am in culnary heaven. I love to cook got no oven; m/wave just become my new BFF. Thanks for all the posts. I can’t believe you would ruin a good apple pie. Why not just top it with sour cream and realy ruin it. Apple pie and cheese the old fashion way……………………cheese all the way for sure. There used to be a restaurant, very popular, in my town called “Robin Hood”. Yeah, over the top decor with all the sherwood-Forest-type kitsch. But–they made an apple pie that was absolutely fabulous, and you could order it with or without a slice of cheddar on top. Awesome stuff either way. Can u use canned pie filling?